Scenario #1: Lizzy shops for a tartan dog leash on Leashy.com and makes a purchase. She is bombarded with ads for the same leash for months. Frustrated, she goes to the etailer’s app and closes her account but continues to receive offers by email. She reports them as spam. Scenario #2: Frankie buys a cat leash at Leashy.com. He notices a few ads on his favorite smartphone gaming apps for a handsome kitty collar. He downloads the retailer’s app, buys the collar but opts out of email offers. He never gets an email but notices further complementary accessories on his next visit to Leashy’s website. What’s the difference? Only that the marketing leader in scenario #2 has mastered identity. While the methods of stitching identifiers and building profiles are complex, the payoff is easy to understand: a better consumer experience and higher lifetime value. Managing identity can power more effective multichannel engagement, improve targeting and creative tactics and make measurement more accurate. Good identity resolution and management enables a marketer to approach the “people-based” experience advantage held by platforms like Facebook, Google and Amazon. Such platforms have a user base that identifies themselves by logging in across devices and browsers, allowing a consistent experience. Consumers are increasingly primed to expect the same experience from every marketer. The average U.S. adult has four digital devices and spends five hours a day using them, according to Nielsen. Sixty-seven percent of these adults use mobile devices to research products and services, according to the Consumer Technology Association. Meanwhile, 60% of consumers who research a product on a mobile device end up making the purchase on a different device or browser. Leading marketers try to link devices and browsers to individuals – anonymized or known – and to layer on additional information from campaign management and other systems. Forty-three per cent of marketers said cross-channel audience identification and matching was a top concern in a recent Interactive Advertising Bureau study. Gartner estimates that the number of devices per person, including smart TVs and wearables, will grow to more than six by 2020. Consumer expectations for recognition and relevance will also rise. Managing identity is rapidly becoming a requirement for success. This practice is not new. Starting in the pre-digital era, marketers were challenged to match different forms of names and addresses, keep up with moves and associate people with demographic and other data. Statistical techniques such as record linkage were developed to determine whether different records likely belonged to the same person. Marketing service providers such as Acxiom, Experian, Epsilon and KBM Group continue to maintain authenticated identities for almost every consumer and business in developed countries. Digital identity management extends this practice into the fragmented digital sphere. Marketing identity is not just binary: known or unknown. It is also not synonymous with cross-device identification (XDID) or “device matching,” which is an important subset of it. It is best seen as existing on a spectrum that develops in detail from generalized anonymous data to authenticated personal information, with many shades in between. Location: Person and device cannot be identified, but the location can be determined or inferred. Single Device: Person is unidentified, but the device in use is associated with a pseudo-anonymous identifier. Used for: Organize data collection; recognize people and track journeys. Multiple Devices: Different devices (such as a browser and mobile device(s)) are associated with one another and assumed to belong to the same (unknown) person. Used for: Organize data collection; recognize people and track multi-device journeys. 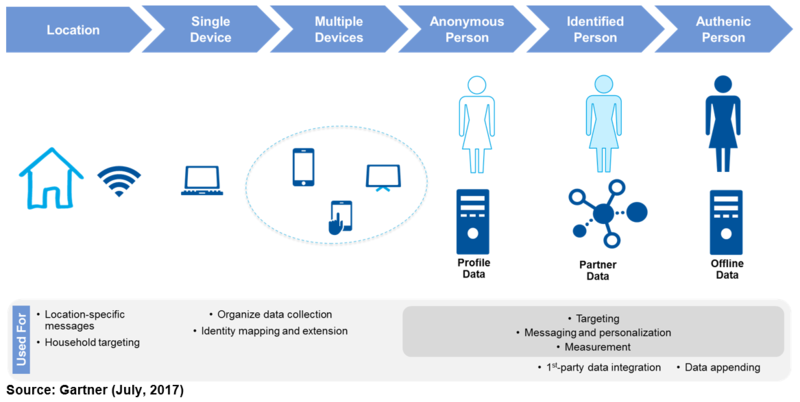 Device(s) to Pseudo-Anonymous Person: Matched devices are linked to relevant attributes, including segments or audiences, past behaviors, privacy settings, etc. Used for: Targeting, messaging, personalization, measurement. Device(s) to Identified Person: Matched devices are linked to some form of P.I.I., often an email or a customer ID. Used for: Personalization, measurement, integration with first-party data (e.g., CRM, POS, loyalty system). Device(s) to Authenticated Person: Matched devices are linked to a real person in the (offline) world. Used for: All of the above; also, appending data such as demographics, income and credit, purchase patterns, car ownership. Marketers use the level of information available to them. Each type of identity can be used to improve outcomes. At any one time, marketers will face customers and prospects at all levels, as well as many who can’t be identified at all. Also — identity continues to change, as people delete and refresh identifiers, lose and change phones, and so on. There is no set identity in marketing; it’s a continual flux. The best marketers treat identity as an approximation that part of a streaming information engine, not a database. The above stately prose was excerpted from an upcoming report called “What Marketers Need to Know About Managing Identity” (available to clients). For more on the device matching problem, see this classic blog post and its exciting sequel. Enjoy.